Alex Jacob is a United Reformed Church Minister. A Director of The Churches Ministry Among Jewish People (CMJ), Alex has a respected teaching and pastoral ministry. He is also author of the well-received The Case For Enlargement Theology which provides a much needed counterpoint to the false ideas of Replacement Theology and Two Covenant Theology – both of which try, and yet fail, to define a 'place' for Jewish people in terms of the Church. Alex also authored, Receive The Truth!, Walking an Ancient Path and Prepare the Way, in the same genre. Daily study notes over a 100 day period. 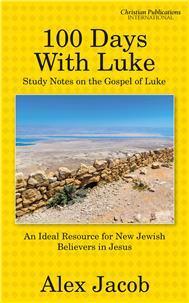 The book is designed as a resource specifically for new Jewish believers in Jesus, and yet its appeal goes much wider. The issues that a monotheist Jew will encounter will be much the same as those encountered by a monotheist Muslim. These studies are short, punchy, incisive and yet encourage searching reflection. They are a great introduction to the Jesus-message for anyone who is new to the faith - not to mention many of us who have been Believers for some time, but who want to explore Jesus in a fresh way. The notes explore both theological and pastoral themes, yet are not arduous as a reading assignment! For those looking for a starting point in study and reflection. Preachers, bible study leaders and students will all benefit from this book. A helpful introductory gift to encourage the wonderful habit and discipline of bible study, linked to personal application and reflection. This book can also be used in group study contexts, where for example, it might be used as Lent Course material. Some of our books are available through Amazon. When buying through Amazon, note that various services are periodically offered on a subscription basis in addition to the purchase actually being made. Sometimes Amazon expect customers to “un-check” a check box so as to opt-out (rather than opt-in) to the purchase. Our advice is to be alert for opt-outs, which may not be prominently displayed. And of course if you are required to “un-check” a box, then DO un-check it!